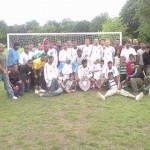 against London Tigers FC. As the final games of the BFA Summer league Premier Division went underway in week 11, it was also slotted in as the final game of the day. 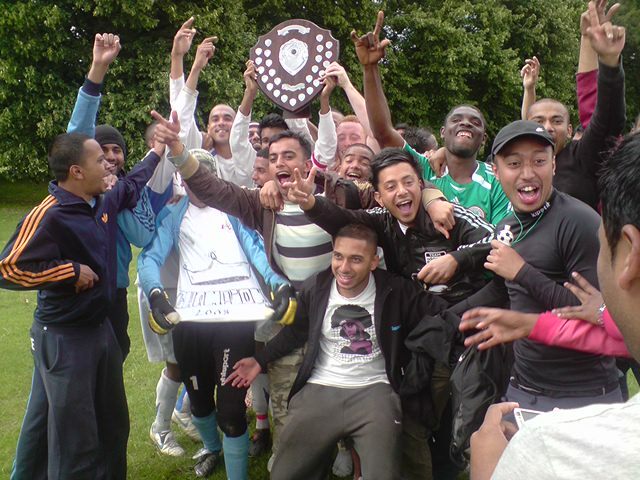 Shadwell FC were on top of the table having played there last game the week before, cheers for them were short lived as Mohammaden secured top position having won their game against Arbour Youth (3-2) in the midday fixture of week 11. 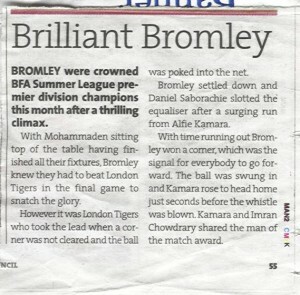 It all rested on this game as a win for Bromley will secure the title and a draw/loss will make Tigers or Mohammaden winners, depending on goal difference. A shaky start from Bromley who fielded Amin Ali (GK), Imran Chowdrary, Abdul Hasnath, Justin Garderner, Shahin Ali, Iftekar Ahmed, Oliur Rahman, Alfie Kamara, Bahar Ali, Daniel Saborachie aka Danny, Ainsley Gasper and on the side Danny Lodge, Dipon Ali & Emran. As the ball was intercepted by London Tigers in Bromley’s half. Tigers were passing the ball in quick succession to create space and use the width of the pitch to swing the ball into the box, but the clearing header’s from the defence eased the ball into Bromley’s possession. The battle in midfield that was said to be tough was so, as both teams risked grinding the opposition team down into a mound of dust. Iftekar and Alfie were pitting against London Tiger’s five men unit who supplied the forward and broke into Bromley’s box a few times to raise a few eyebrows. They finally did as a cross from the corner was not cleared at two attempts and was nicked by the London Tigers who poked it into the net from inside the box. Bromley quickly regrouped as the 150 or so supporters energised the team, the first half was far from over as 15 minutes remained on the clock. Danny had a few good chances ripple in the air as he was now comfortable and enjoying some attacking possession along with Bahar who was on the left flank and had crossed the ball to Oli’s feet, who snapped it into the keepers arms from a few yards. It was only after a few good attempts that Alfie’s bursting run into there half allowed him to play in Danny behind the defender’s who slotted the ball into the net (1-1). 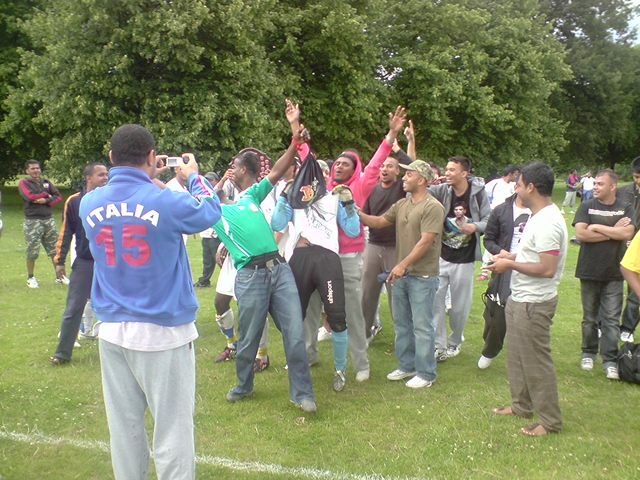 The crowd of Bromley fans/supporters and well wishers were ecstatic as a rapturous applause silenced the Mohammaden FC crowd, London Tigers fans and stunned many onlookers. This lifted the Bromley players for a short while as the half time whistle drawed the team together again. The Manager Shoffique who made encouraging gestures throughout the first half had pin pointed a few changes into the game that was needed to allow more possession with the movements that they were making in the midfiled area. The second half was underway without any changes, the passing wasn’t as crisp as the end of the 1st half but Bromley clinched onto a few loose balls as London Tigers started forcing Bromley into giving away corners and fouls just outside the box. Amin (GK) had collected a few securly and calmly, but other chances where akimboed out of the box by the defenders. Imran had plently to do as he tackled and cleared many breaks that where made through the right wing. As Alfie and Ifte’ were trying to spread the play to Abdul and Ainsley another great ball over the defence found Danny who looked offside but wasn’t as he lobbed the ball wide of the post with the keeper already rooted. As chances were scarce in the second half for Bromley this was too good to miss and Danny knew it when he missed it. The second half then rallied on with defined moments of quick passing from both teams to create chances and force errors for a goal scoring chance but most were hoofed by the defenders as they cleared. Danny Lodge and Emran also came on for Bromley to provide that extra inspiration and energy to the team. This was to be translated into a foul and free kick to London Tigers, just outside the Bromley box. A well struck shot shaved the bar as Amin held onto it to make sure nothing slipped in. Bromley were now desperate for a goal as a draw wasn’t good enough as Mohammedan fans imitated the final whistle, all the players pushed up to support any attacking chance or darting run for a cross, this resulted in a corner for Bromley as Tiger’s dropped back deep into there box. As everyone aligned themselves into the box including the Bromley keeper who made a dashing run from the otherside of the pitch, Danny placed the ball near the corner flag as he measured in a weighted cross to the crowded box to find leaping Alfie Kamara to rise and nod in a winner (2-1). The final whistle was drowned by the noise of the Bromley fans as it was blown moments after. 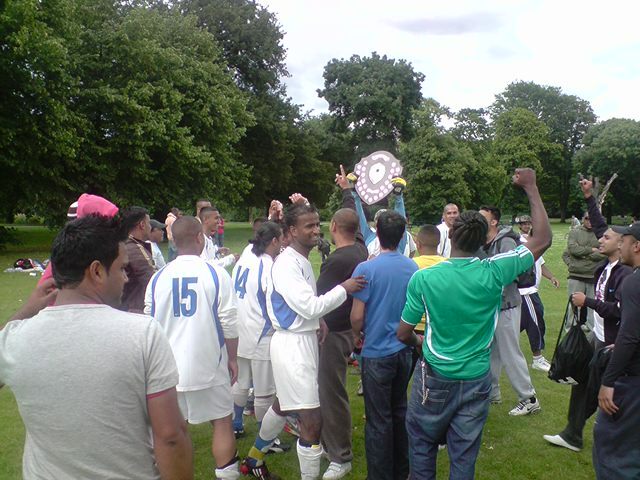 Bromley players and fans celebrated the BFA Summer League Title 2008. 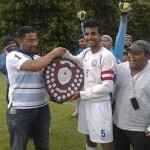 Man of the Match: Shared between Alfie Kamara and Imran Chowdrary. Final Score: 2-1 to Bromley FC. Above: EastEnd Life Article, thanks to Amin on the submit. Oli rips net to secures Bromley win..
2-0 against SYA FC. A goal from outside the box from Danny gave Bromley the lead as good passing and movement left SYA checked. Oli scored a header from a cross that saw the keeper rip the net as he got tangled. A comfortable win for the manager who was pleased with the attitude and character of the team. 2-0 to Mohammedan B. As chances went begging, Mohammedan took their’s and the 3 points. The Manager Commented “We didn’t pin them back but I am happy with our performance to an extent. However, we lose 2-0. The level of commitment was good. We created chances. They took their chance, we didn’t, but there are a lot of pluses for us”. 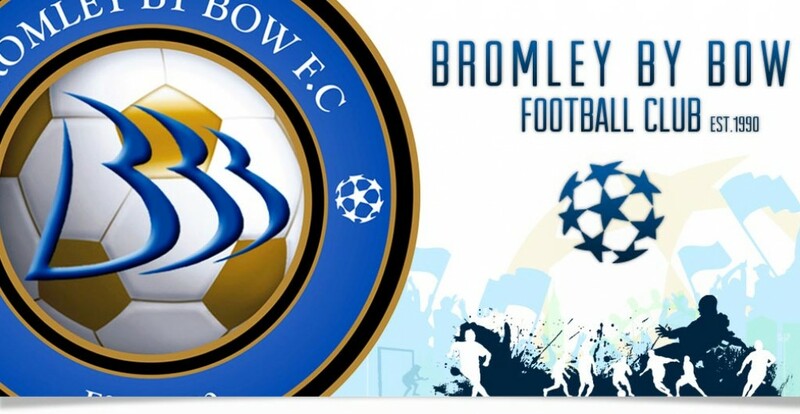 as they win against Bromley FC who were leading the game by one goal as the second half saw two goals by Shadwell in a matter of minutes, one of which was a 30 yard bobble that left the keeper dis-orientated. The Shadwell FC keeper did well to keep Bromley’s goalscorer, Alfie at bay with fine saves. 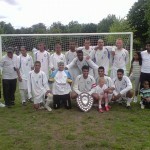 A defensive mix up at the Bromley end in the final moments ended the game 3-1 to Shadwell. Manager commented “An excellent first half had slipped away in the second, as we lost concentration and were second in every department”. as they win 3-0. A brave team performance from the defeat they suffered last week saw goals from Shipon, Prince and Kobir. All were distinct from each other and had put the game beyond Vallance. Syful, who was on in the second half rattled the bar as Bromley B were searching for more goals. Prince played his part with his highly elaborate celebration from his cool finish and so did Shipon with his half volley. Manager Nagim Commented ” A good win that saw the team play with more urgency and fluency that they had lacked in the previous games. We had good possession which made the game out of bounds for the opponent, even though they had 1 or maybe 2 chances that could off brought them back into the game”. Youth FC as they lose a well dominated game against Elite. A tackle by Shipon in the area gave away the penalty in the second half that left Bromley chasing the game until injury time, as the defenders got exposed to another goal as they pushed for the equaliser. A goal was disallowed as were many debatable offsides decisions which saw Elite on defensive mode. 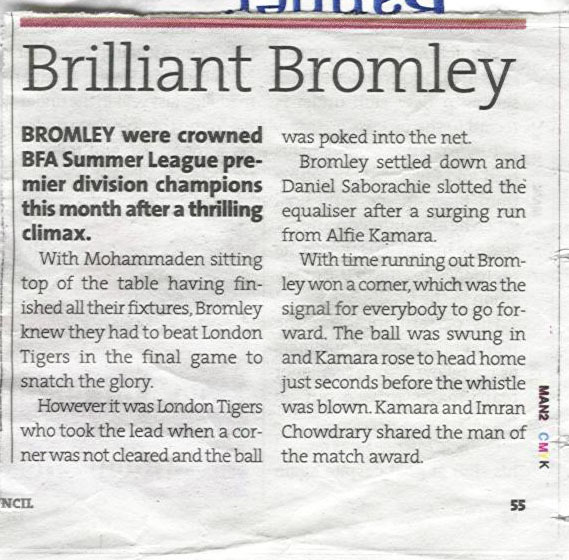 Present was the backroom staff Shamsul Haque who forgot to bring the half time drinks and commented “If anything, the victory should have been with Bromley B, we’ll reflect on what we did well and what we can improve on. We know we can dominate a game but its the points that matter now which can take you into promotion. I will also like to take this opportunity to invite all the brothers to Jamaat during the summer holidays. ” Final score 2-0 to Elite Youth. Probashi cause problems for B..
as a 7 goal thriller see’s them into the next round with ease. A few goals from Bahar and a Alfie hattrick secured the progression into the next round. A good all round performance from the players saw them take there chances. 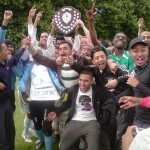 Also note that Keeper Amin played upfront and nearly score a goal !! Manager Shoff’ commented “that the game plan was to force them into mistakes and make them pay for it”. Final Score 7-1 to Bromley FC. 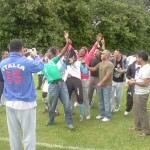 B team as the game was decided on penalties after Hamid scored a equaliser to take the game into a penalty shootout. A fine lob made it 1-1 and the brilliantly taken penalties saw them into the next round. The manager was pleased with the team efforts throughout the game. after beating Mohammeden B, 7-0. An excellent performance by Danny who finished the game off with a bag full of quality goals as he got 4 and also a notable spectacular strike by Bahar Ali from outside the box left the keeper rooted. A convincing performance that see’s them play Abohani FC in the QF’s. The manager praised the team that showed a lot of character. Final Score 7-0 to Bromley FC. Bromley B left to Ponder..
A 5-2 win over Ponders End FC made certain that Bromley reached the Final, the team that knocked out the B team had conceded in the 1st minute as Danny scored an easy tap in. Bahar got 2 goals, one of which was a fine header from Danny’s cross and another was a slot in from a tight angle. Danny, Man of the Match got his second from a fine lob from outside the box with Alfie firing in a shot before that into the net. Both Ponders goal were scored from the spot, as the referee spotted an infringement twice in the Bromley box from Justin and Imran. A few Video goal highlights can be seen below. 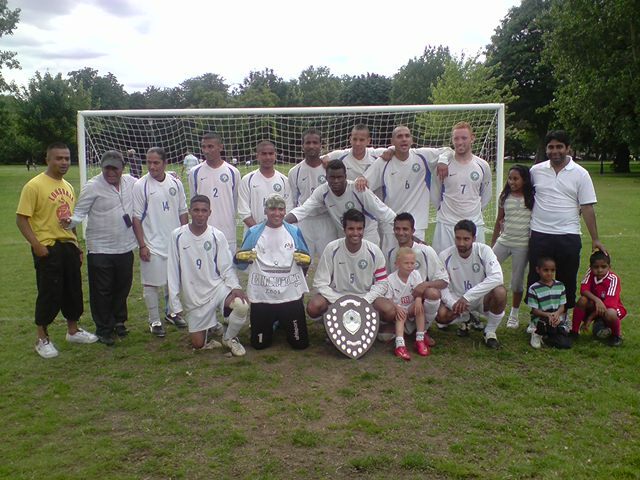 Bromley play Shadwell FC in the Sonali Cup Final, the current league leaders in the Premier Division with Bromley a point behind them. as it is all to play for in the final league game with London Tigers. 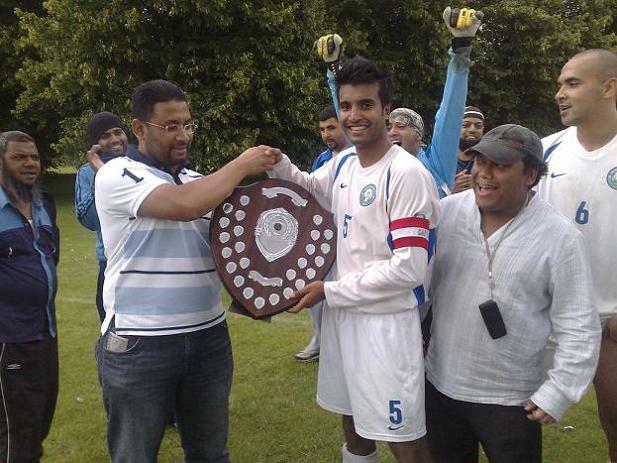 A win will secure the title as Shadwell failed to crown themselves in their final game this week as they lost 3-1 against Mohammedan FC. It all comes down to the results of the final games for the BFA Summer Premier League played next week as 4 teams are still in the running for the title. This weeks game buckled up to a great battle in midfield as both teams didn’t leave any loose balls for the taking. Bromley created a few good chances in the first half as a fine shot from Danny was whiskers away from the goal. Stepney played on the counter and did not trouble the defence or the keeper. A few chances could of been prowled on but the ball left the field before it touched the players feet. The second half favoured Bromley for the start as the Stepney keeper made some good saves. Oli, Mukith and Danny came close but it was Alfies tackle towards the end that set Danny through on goal which he tee’d up Bahar to calmly collect the 3 points. Final Score: 1-0 to Bromley FC. Manager Shoff’ commented “It was a brave performance in a tight game with few real chances, our eagerness and urgency at the start of the second half controlled the rest of the game and gave us the 3 points. 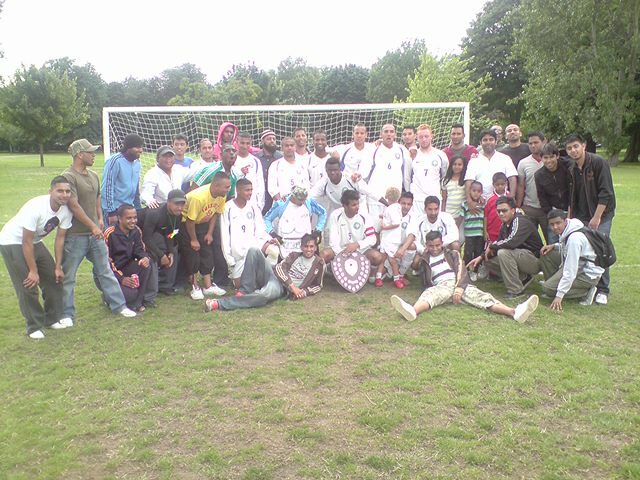 This game has set the willingness and desire to play the final game and get a result the team and supporters want.” Bromley also await the date/venue of the Sonali Cup Final against Shadwell FC. 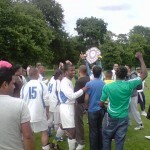 as they came back from conceding a goal to winning 3-1. Striker Prince got them level as he swiped the ball around the keeper to slot it in. The second followed in a similar style as Prince took it round the player and keeper in one movement to find the back of the net. A well dominated game that Bromley B using the field to move the ball around and switch play. It was in the second half that the game was out of bounds for Newham FC as Abdul Hamid turned 2 players outside the box to drive in a low shot to beat the keeper to the bottom corner. Final Score 3 – 1 to Bromley B.
as Bromley B were winning 3-1, the game had to be abandoned as Robin Hood FC caused a controversial bust up with the linesman near the end of the game. After leading the game 1-0 through a Micheal penalty in the first half with Robin Hood missing one which was saved by keeper Ingle, the game was all to play for. The second half saw Prince on form with great strides as he drove in a shot that left the keeper standing. Great all round movement by the team saw another goal from Prince as he headed home another goal from a corner to add to his tally. Robin Hood FC got a goal back as Bromley B snoozed out of position for a second but this bought player Hamid into action as he got a red card for his passion and eagerness. As moments after the players from Robin Hood caused great corcern over the safety of the linesman after a controlled decision which lead to the game being abandoned. 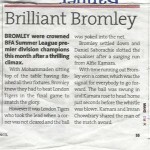 BFA will follow up reports by the referee and Bromley should recieve 3 points as they did not play any part of the incident. Bromley B still have a few remaining games in there division and hope to battle for a place in top half of the table. Stand in Manager Shamsul made no comments. as the first goal was by Prince he took the defender on as the defender clipped his left foot on his right, but bemused Prince still bulleted the shot bottom right hand corner, left the keeper rooted. The second goal was a Cutting through ball by Micheal to Isaac, who left the defender clueless assuming he was offside and the keeper was rooted again as he was brushing of the dust from the first goal. The second half saw a steady display of football with Bromley B conceding a goal. As Bromley B were winning 2-1, the game had to be abandoned with 5 minutes left of the game. BFA are investigating the referee reports as Bricklane were involved in an on and off the pitch incident. Ace play there cards right..
as they win 4-1 against Bromley B.